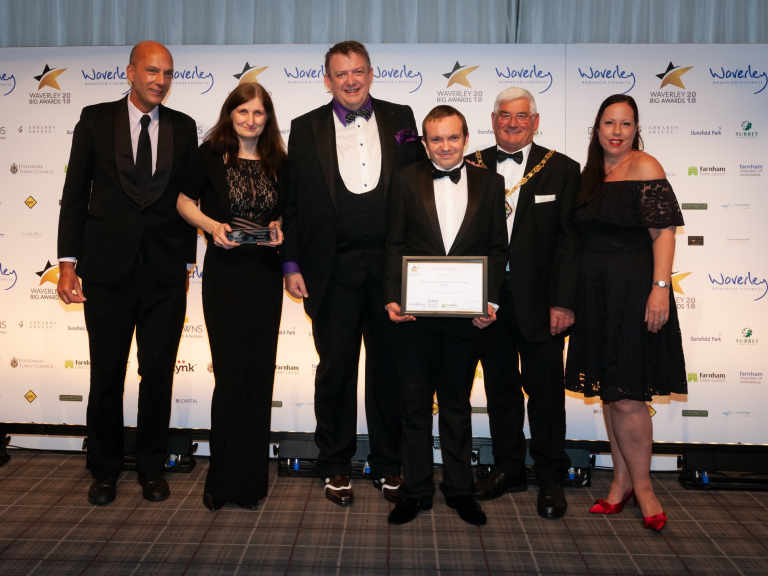 The Waverley BIG Awards has been created by businesses for businesses, to recognise, promote and celebrate the achievements of the innovative and entrepreneurial business community in the Waverley area. Entries were invited from businesses of any size and at any stage of growth, including not for profit trading organisations. On Friday 19th October the winners were announced during a gala awards ceremony, at the Lythe Hill Hotel, Haslemere. 200 sponsors, qualifiers and guests were in attendance, recognising the best that Waverley has to offer! We are delighted to confirm that thebestof Waverley business member Branston Adams Accountants and Advisors has won not one but two prestigious awards! Following the event Branston Adams told us “All the team at Branston Adams feels humbled; delighted and thrilled to receive ‘double recognition’ for doing what we do and truly believe in, ‘look after the Community and the Community will look after you’. There is no greater accolade than to be recognised by your peers and community. We would like to give everyone involved the biggest THANK YOU”. Congratulations to all entrants in the Waverley BIG Awards, this event has highlighted the commitment, success and achievements of our talented, local business community. Image courtesy of The Remarkable Studio.